On tour this summer, just outside of Yakama on a hot mid-July Day I started hearing a rhythmic thunking as I rode on an overpass. I pulled over and slowly pushed the bicycle forward looking for things dangling, or rubbing or something. And look what I found. This is why I use Marathon Plus tires and don’t even bother messing with other tires on my Atlantis. 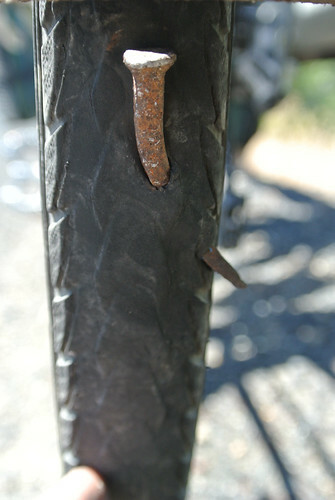 I rode over 2000 miles, fully loaded, in the Cascade and Sierra Mountains after this incident. The tire, while plenty worn now, is still in service.